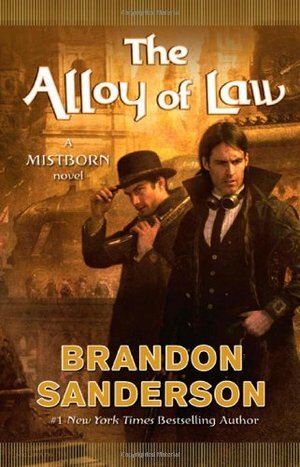 Fresh from the success of The Way of Kings, Brandon Sanderson, best known for completing Robert Jordan’s Wheel of Time®, takes a break to return to the world of the bestselling Mistborn series.Three hundred years after the events of the Mistborn trilogy, Scadrial is now on the verge of modernity, with railroads to supplement the canals, electric lighting in the streets and the homes of the wealthy, and the first steel-framed skyscrapers racing for the clouds.Kelsier, Vin, Elend, Sazed, Spook, and the rest are now part of history—or religion. Yet even as science and technology are reaching new heights, the old magics of Allomancy and Feruchemy continue to play a role in this reborn world. Out in the frontier lands known as the Roughs, they are crucial tools for the brave men and women attempting to establish order and justice. One such is Waxillium Ladrian, a rare Twinborn, who can Push on metals with his Allomancy and use Feruchemy to become lighter or heavier at will. After twenty years in the Roughs, Wax has been forced by family tragedy to return to the metropolis of Elendel. Now he must reluctantly put away his guns and assume the duties and dignity incumbent upon the head of a noble house. Or so he thinks, until he learns the hard way that the mansions and elegant tree-lined streets of the city can be even more dangerous than the dusty plains of the Roughs. Original Impressions 11/10/14: Omg finally done! No offense, AoL. Finally finished reading during wedding time. It was fun and a lot lighter than the main Mistborn story line. Probably 4.25 stars? So not fair to this book that I barely got to read more than 5% at a time. Always want more and love the allusions to the original story line/time period! But of course, always want more of that. Full review posted HERE on The Book Addict's Guide 12/26/14: Of course immediately after inhaling the first three books in the Mistborn series (grouped together as a trilogy since The Alloy of Law takes place three hundred years after THE HERO OF AGES and is really more of a spin-off), I had to start the next book in this series. I grew obsessed, craving for more, and couldn’t get Sanderson books off my mind. This was actually the shortest book of the series so far (at only 300+ pages versus the usual 500-700 (depending on what version you’re reading)) and yet it took me the longest to read. Part of it was that I started reading it before my wedding so for a good two and a half weeks after I started, I really read nothing at all. Another reason is that I was really pining more for the original characters and plot than the spin-off but nevertheless, I enjoyed THE ALLOY OF LAW very much!